Our Abpromise guarantee covers the use of ab7064 in the following tested applications. 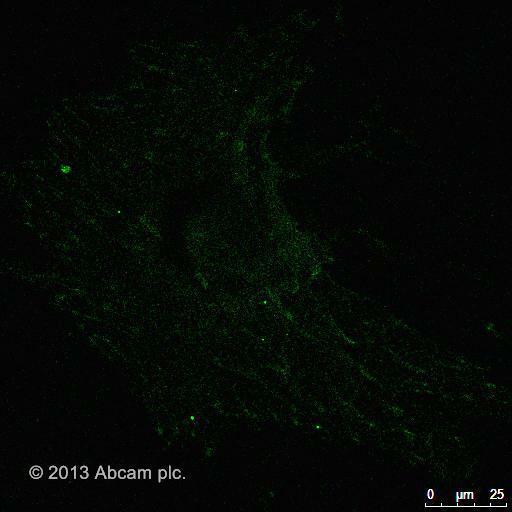 LAMP1 was detected with a mouse antiLAMP1 antibody in ICC/IF analysis of BS-C-1 cells. Anti-LAMP1 was visualized using ab7064 at 1/500 diulution. Overlay histogram showing Jurkat cells stained with ab8090 (red line). The cells were fixed with 4% paraformaldehyde (10 min) and then permeabilized with 0.1% PBS-Tween for 20 min. The cells were then incubated in 1x PBS / 10% normal goat serum / 0.3M glycine to block non-specific protein-protein interactions followed by the antibody (ab8090, 0.01μg/1x106 cells) for 30 min at 22°C. The secondary antibody Goat anti-mouse IgG H&L (FITC, pre-adsorbed) (ab7064) was used at 1/1000 dilution for 30 min at 22°C. Isotype control antibody (black line) was mouse IgG2a [ICIGG2A] (ab91361, 0.01μg/1x106 cells) used under the same conditions. Unlabelled sample (blue line) was also used as a control. Acquisition of >5,000 events were collected using a 20mW Argon ion laser (488nm) and 525/30 bandpass filter. Ab7064 was used at dilution 1/20 with the primary antibody ab7852 in ICC. See the review on ab7852. Ab7064 was used at dilution 1/2000 with the primary antibody ab2378 in IHC-P. See the review on ab2378. Publishing research using ab7064? Please let us know so that we can cite the reference in this datasheet. This is a good antibody and a stable conjugate. The luminous intensity of the conjugate is good and is stable (can still be evaluated after a long time). This is a good functioning antibody with a stable conjugate. The binding is very specific and the luminous intensity of the conjugate is good. Mouse Osteoblast cells were grown on cover slips for 48 hrs. Then Cells were fixed with formaldehyde vapor for 10 mins. Cells were permeabilized with Triton-X 100 for 5-7mins. 3% BSA was used for blocking (1hr). 1:100 dilution of mouse anti-talin antibody to mouse was added onto the cells and incubated for 1hr. Then 1:500 dilution of anti-mouse FITC conjugated secondary antibody was added on to the cells and incubated for 1hr. Before proceeding to each step cells were washed with PBS. Thank you for confirming this details. In my understanding this results show that the ab24590 isfaulty as it has been used with two different secondary antibodies without success. I provide you here therefore with the credit note for this antibody. The credit note ID is xxfor the ab24590. In regards to the ab7064, I expect this antibody to work with another primary mouse antibody.I do not think that this antibody also should be faulty. Pleasedo let me knowhowever if you have anyconcerns in this regards. Thank you for your help and cooperation also in this case.Please let me know if you have any questions. Thank you for taking time to complete our questionnaire and for contacting us. I am sorry to hearthat the customer is notobtaining a staining with this two antibodies. The details provided will enable us to investigate this case and will provide us with vital information for monitoring product quality. I appreciate the time the customer has spent in the laboratory. It is regrettable the results have not been successful. Having reviewed the protocol details, I believe these two products should have given satisfactory results. It appears that you may have received a faulty vial. I apologize for the inconvenience and am pleased to offer you a free of charge replacement, credit note, or refund in compensation.In order however to replace the right antibody, we need toknow whether the primary or the secondary antibody is faulty. Can the customer therefore either test the secondary antibody with another mouse primary antibody which is known to work, or alternatively use another secondary antibody witht hte ab24590 to see whether the problem is due to the secondary antibody? Thank you for your cooperation. I look forward to hearing from you.